We are a leading Manufacturer & Exporter of Motor Starter Springs. Our product range also comprises of Compression Springs, Torsion Springs and Conical Spring. Offered by us is a superior quality range of Motor Starter Springs to the clients, as per their specific requirements. 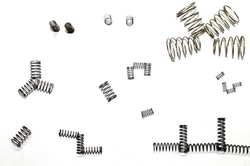 We procure high-grade raw material from some of the most trusted vendors of the industry to manufacture these springs. Moreover, we follow international quality norms while carrying out production & other related processes of these springs.